It's a mixed bag of front pages this Friday, reporting on Brexit, alcohol deaths and missed cancer targets. The News Letter headline says that the DUP "stands firm as Brexit chaos goes on". The party's deputy leader, Nigel Dodds, said it will vote against the EU withdrawal agreement when it comes before the House of Commons on Friday. If MPs support the proposal, the government has said the UK will leave the EU on 22 May. However, it is unclear whether the motion will achieve enough votes without the DUP's support. 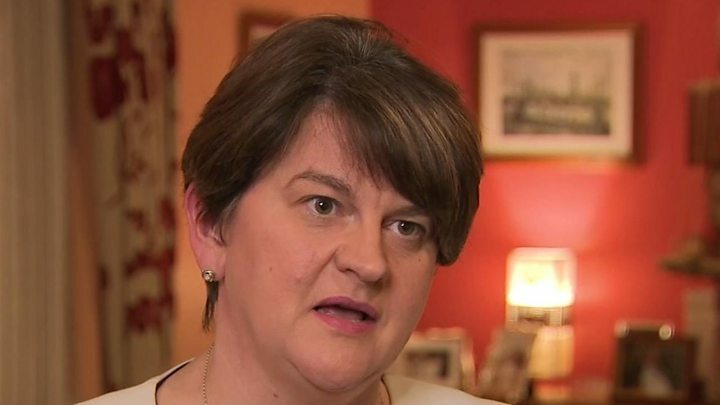 Arlene Foster, in the Belfast Telegraph, said she is "inundated with support" for the party's Brexit position. "We cannot vote for a deal, including the backstop arrangement, which could undermine the union," she writes. "We have been inundated with support for our position from all across the United Kingdom as ordinary people see that the DUP is putting the union first." The Irish News reports that Theresa May will attempt to get MPs to back part of her Brexit deal later, in a bid to secure a delay until 22 May. Inside, an opinion piece by Martin O'Brien says that "Brexit should never have come to this", and argues that "what is particularly scary about the Brexit crisis is the number of times we've heard the words 'nobody knows' from the lips of people whose job is to know". 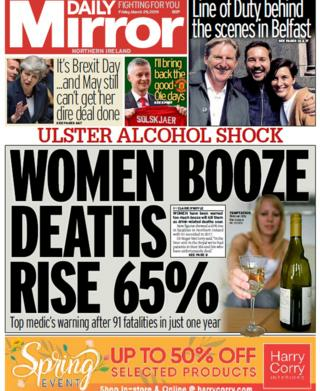 The Daily Mirror leads with the story on the growing number of women dying from alcohol-related diseases. Dr Roger McCorry, who leads the Belfast Trust's Alcohol Care Team, said the number of young women he is seeing with advanced liver disease was "tragic". The newspaper also reports that people in Northern Ireland are being scammed out of £14,000 a day in phone, postal and romance scams. It reports that in February alone, £391,571 was stolen from people across Northern Ireland. PSNI chief supt Simon Walls said that people must remember that "everyone has a scam with their name on it". The Belfast Telegraph reports that only 60% of cancer patients in Northern Ireland started their first treatment within the target time period. New figures have revealed that 193 patients (60.5%) started treatment within the target 62 day period, compared with 66.8% the year before. A Department of Health spokesperson said that while breast cancer waiting times have improved, cancer services "remain under pressure". A health charity has urged retailers to stop selling Easter eggs too early to help tackle the obesity crisis. The News Letter reports on finding from the Royal Society for Public Health (RSPH), which found that at least one Easter-related chocolate treat and almost a quarter (23%) have already bought and eaten at least one full sized Easter egg. "Our research suggests that the public find [selling these treats too early] mildly irritating and it is just putting unnecessary temptation out there," said RSPH chief Shirley Cramer. Good news for Derry Girls. The hit show has been nominated for a Bafta award, reports The Irish News. The Channel 4 show written by Lisa McGee has been shortlisted in the scripted comedy category. Creator Ms McGee based the show on her own experiences growing up in Londonderry.